Build Quality (6.5/10): Though they may seem fragile at first,the KSC75s can withstand a lot of abuse. The plastics of the housings aren’t particularly high-grade and the clips do come off once in a while, usually when they get snagged on something, but they are easy enough to reattach. Long-term durability is excellent and Koss’s excellent lifetime warranty deserves a nod here as well. Comfort (8/10): Initially, they do feel a little awkward and not very well secured. The clips can be bent to fit your ears, however, and they do stay on very well. My ears can get sore from the clips after very long stretches but overall, they are very easy to wear for a long time – the clip-on design prevents headband pressure and the open, foam-padded earcups do not invoke sweat. 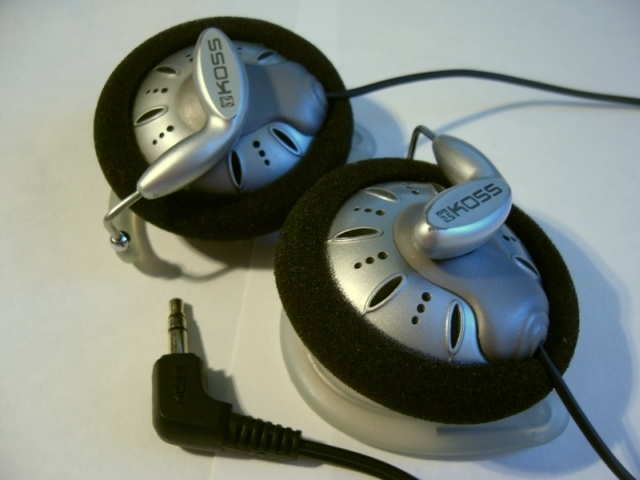 Isolation (2/10): The KSC75s are open headphones and will not isolate you from your surroundings or vice versa. Therefore they are less than ideal on loud busses, trains, airplanes, etc. They are perfect when you actually want to hear outside hazards though, such as while jogging, and also in reasonably quiet places (e.g. home, coffee shop, park). Sound (6.25/10): In this motley group of test subjects, the KSC75s definitely shine in openness and fullness of sound. For the price they do almost everything right – instrument separation is surprising for a phone of this price, the midrange is full-sounding, and the highs are present in quantity and can sparkle on occasion. The bass is slightly muddy and unrefined and doesn’t extend particularly low, instead creeping up on the lower midrange. Top-end extension is similarly average, though they surpass most headphones in the price range. Soundstaging is pretty intimate for an open headphone and the overall presentation is rather forward and aggressive. The 60 Ohm impedance means that these are very forgiving and can be used straight out of virtually any source without hiss. Value (9.5/10): The Koss KSC75s provide an unmatched combination of practicality, durability, comfort, and impressive sound characteristics at their price point. The overall sound is forward and aggressive, with plentiful bass and treble. They can also serve as a (disposable) bridge into headphone modding, backup or gym set, or decent-sounding loaner phone. Every head-fier should own a pair (or two). I love the sound signature of the KSC75. Not much I would change. Having said that, if I wanted to and was willing to spend a little more, what would be my first stop to get a noticeable sound quality improvement? Bonus points for added comfort and external noise insulation? How about the Piston 3? It’s a little tough to directly compare a set of earphones and a set of headphones in sound – even with similar tuning they’ll each do some things better than the other. The Piston 3 is not that similar in tuning though – it’s quite a bit leaner and less warm. Probably want something like an RHA MA750 to be both a spiritual successor and upgrade to a KSC75. Says a lot for these phones, considering you’ve got to jump that much higher in price. What if we’re talking headphones? The RP-HTF600-S sound like they have potential.. A little more insulation, similar freq response (as far as I can tell) and perhaps a little more comfortable. The Panasonics would indeed be a good one. Pro DJ100 is a little too cold to take the place of a KSC75 but the HTF600 is about right in terms of tone and very comfortable. Noise isolation is not very good for a set of over-ears though. So I ended up going for the Superlux HD668B. Found a great deal.. around $25 shipped. Seem very similar to the KSC75… a bit more of an “airy” sound, a little bit more bass, a little bit more comfortable and a little bit more isolation. The only con I noticed is that some of the high-end doesn’t seem quite as defined.. don’t know if this will improve with time? I don’t think the HD668B ever gets to sound as sparkly and crisp as the KSC75 at the top end – it seems to be optimized for a smoother sound whereas the KSC75 takes more risks with its treble. Yes, for the price I couldn’t pass it up. I’m not sure there is a discernible increase in SQ.. and I wasn’t expecting much, if any, for $27 (or w/e I ended up paying)… but I don’t think there is a decrease either. My main phones are the Ety ER-6i, HD668B, KSC75… all pretty much in the same “SQ” zone.. but the ones I use are governed by how much noise I want to let in/out at any given time. I’ve got to say though, the HD668B is the best experience overall. I’m not too up to date when it comes to neutral-sounding full-size cans, so not sure what’s considered the next step up these days. I personally have always liked the Beyer DT880/600 as an upgrade to the HD668B, but that’s an upper-tier headphone and not portable. I’m sure there’s something in between that will work well, just not sure what it is. ATH-M50X is a possibility, but I haven’t listened to these a whole lot. They’re pretty portable, though. Not as “full-size” as HD668B but still comfortable also. Hello Joker, great review! I had a couple of quick questions in terms of finding IEM’s and headphones. I really enjoy the sound of the KSC75’s but wanted something with more detail and don’t mind a little more. I listen to grunge and rock and the KSC75 hit it in all the right places. Are there any recommendations on IEM and headphones in the sub $50 range that are close to the 75’s sound signature? Doing my own research this is what I gathered. Could you let me know any recommendations of your own or if I am on the right track? I think it’s the openness and fullness of sound that I really like with the rock, with bass not being a really concern. Really looking for all of that with a bigger soundstage and more detail. Also I have stumbled upon the Koss UR55 as another consideration. Comparing headphones to IEMs is a minefield because the way you perceive certain qualities – mostly bass and soundstaging – differs between them even with similar tuning. In very general terms, the Piston2 will be somewhat bassier than the KC75 while the KC06 will be less warm and more bright. Both have a nice and open presentation for IEMs – the KC06 more so. If you don’t mind its brighter sound, the KC06 will give you good detail and would be a nice move into IEMs. The HD668B is a much more balanced headphone than the KC75. It’s not really similar at all. If you’re okay with something that size, I’d go Panasonic RP-HTF600. Thank you Joker for responding so quickly and I must say sorry for double posting. I just didn’t know where to post and I’ve always been curious about these questions. I guess I got a little too excited to ask it. So for a detailed and spacious IEM I will go with the KC06 over the Piston’s. One other IEM that seems to be close to the KC06 in price and sound was the Brainwavz M1. The M1’s seem cheaper and close in sound to the KC06 I was wondering if it’s worth saving the extra bucks? As far as the HD668B goes, if they have good soundstage and positional cues then I might buy them for gaming and try them out for music. Than get a headphone I prefer for my grunge and rock. I just rather knock two birds out with one headphone. The RP-HTF600 being a closed headphone how is its sound stage and positional quality? What I really want, from a headphone, is to try to get a good sound that matches somewhere around the KSC75 and also has a good soundstage for gaming. Some of these were suggested to me but were not on your website. Just seeing if you had any knowledge on them. The Koss UR55 and the Philips SHP9500. I wouldn’t go with the M1 – it lacks the slight bass emphasis of the KC06 and has a warmer, less energetic sound overall. Plus, the presentation is not as open. The HTF600 is semi-open, I think. Either way, the presentation of sonic cues is good to very good. The HD668B is just so very different from the KSC75 in sound signature that even with the good soundstage it’s not a great match for what you’re asking. As for the Koss UR55, they are good headphones but with the Superlux and Panasonic in the mix I don’t think they are worth discussing. Not sure about the SHP9500.